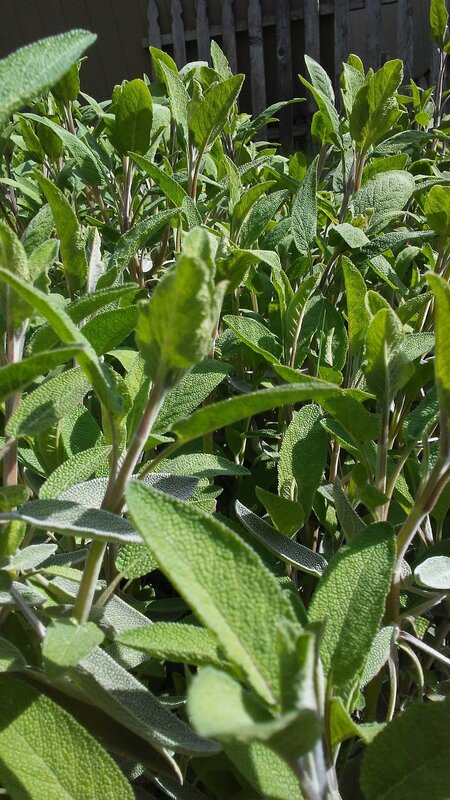 With it's many varieties, Sage is a highly popular herb and is a member of the Mint family. The most common of the Sages is Garden Sage (Salvia officinalis), which I grow for it's many medicinal and culinary uses. It is one of my favorite herbs to help prevent and eliminate head colds, aid digestion of fats, clear the sinuses and soothe sore throats. Sage can also help elevate symptoms of asthma and help clear and dry up excess mucous in the lungs. Common garden Sage is also a lovely ally for new mothers to help dry up breast milk when it is time to wean baby off the breast. I even give Sage tea to our cat to help ease his asthma! Sage is a wonderful friend and plant ally. 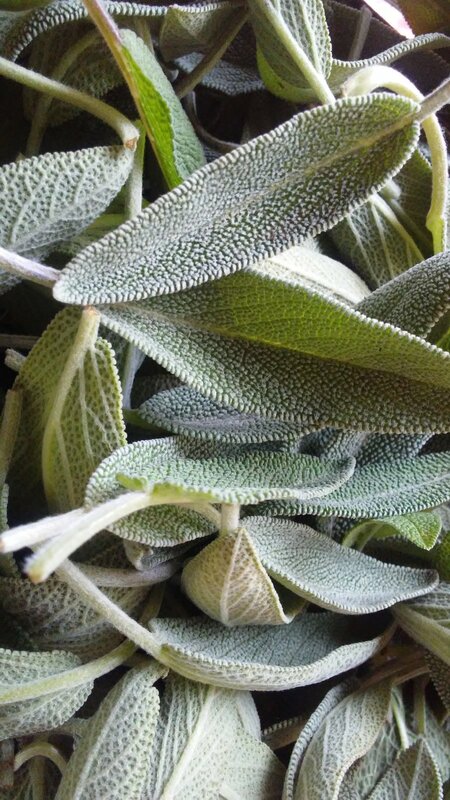 To me, the energy of Sage feels strong, protective and wise. 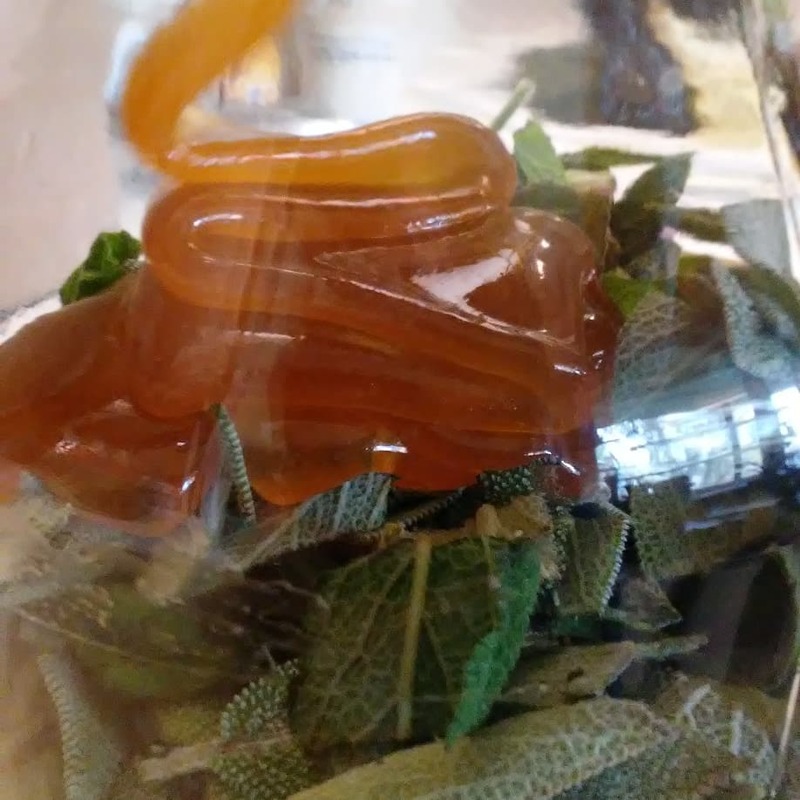 One of my favorite herbal preparations to make with fresh Sage leaves is Sage honey. It is wonderful to have on hand when cold and flu season comes around but also as a deliciously sweet, yet savory condiment. I hope the below recipe inspires you to make your own batch of Sage honey to help keep your mind, body, and spirit healthy, strong and wise throughout the year. To harvest your sage, use a sharp pair of scissors or your fingers to snip or pinch off individual leaves from your sage plants/s one at a time or cut entire stems / bundles all at once. Add each leaf or bundle to your basket and continue your harvest. Pinching the leaves from the main stem encourages more growth and will help provide a continuous harvest of Sage throughout the summer months. I like to take my time and pinch off each individual leaf slowly and carefully. A slow harvest allows an opportunity to give thanks to the plants, align with the plant energetically, and calm the mind. Once the desired amount of Sage is obtained, bring it into a cool, shaded area for about 20 minuets to allow any bugs to crawl off the leaves. 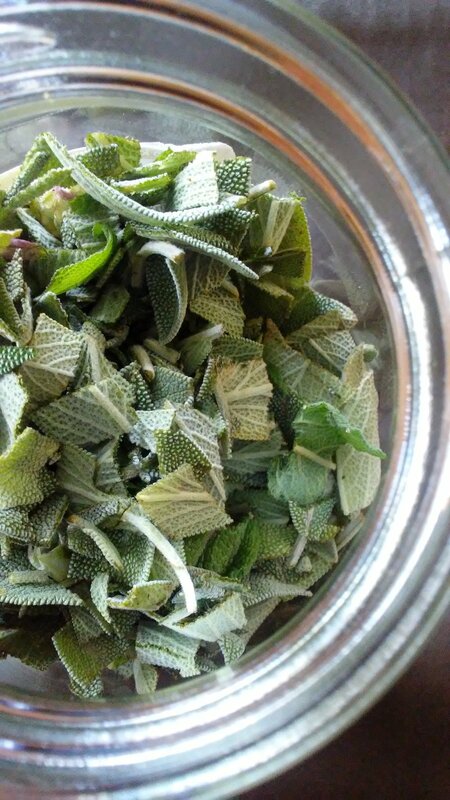 After the bugs have crawled away, roughly chop your Sage leaves and add them to your clean glass jar. Repeat this process until all the Sage is chopped and placed into the jar. Next, simply pour the raw honey onto the chopped Sage filling the jar just about to the top. With a wooden chop stick or butter knife, gently stir the mixture making sure to fully incorporate all of the Sage and honey together. Clearly label your jar "Sage Honey" along with the date it was made, and the date it will be ready, 6 weeks from the made date. Store the Sage filled honey in a cool, dark place for 6 weeks. At the end of the 6 weeks, strain your honey through a fine mesh strainer. Label and store your strained Sage honey in a clean glass jar where it will keep indefinitely. Sage honey can be added to hot water and made into a tasty Sage tea, drizzled onto toast or crackers, or simply eaten by the spoonful to soothe a sore throat, symptoms of common colds, flus and even reduce the symptoms of asthma. Enjoy!